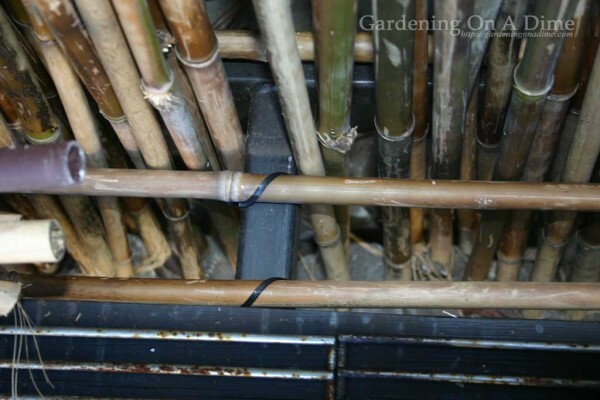 A few years ago we started growing bamboo, both clumping and running. 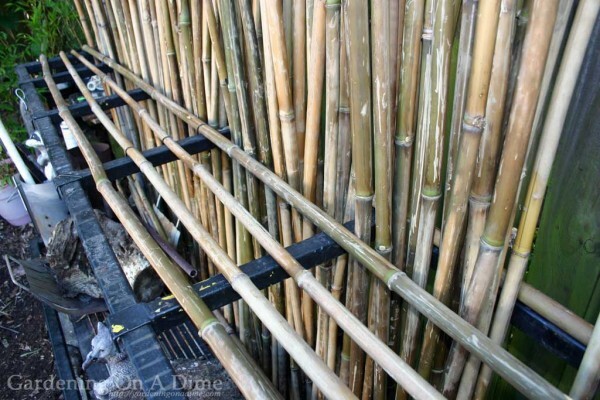 One of the byproducts from trimming and thinning out the clumps is bamboo poles. We’re starting to build a collection that range from six to twenty feet tall. Next year we should be getting even larger and taller poles. 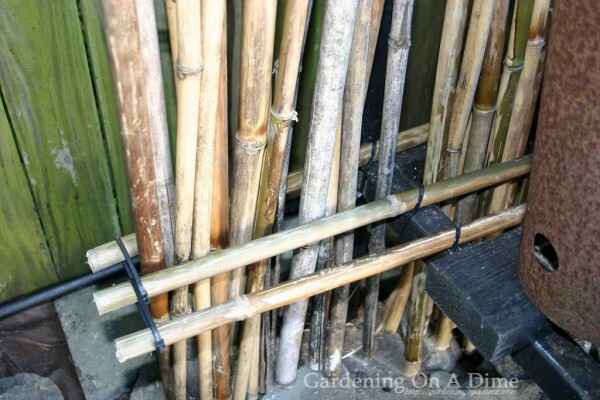 I’ve had several ideas for using these poles but I needed to dry them so that they stay straight and rot free. In the past, we’ve laid them horizontally on large bicycle hooks, mounted on the privacy fence. The problem with that method is that the poles bow on the ends as they dry. Someone told me that a good way to dry them was to stand them vertically and don’t let them come in direct contact with the soil or the bottom ends will rot. Along with the excess pole issue, I also had a spot where I wanted to block out a view over the top of the fence. A bamboo pole screen seemed like it might just visually block enough of the view, yet still let wind blow though the screen. So, the need to stand up dozens of bamboo poles , keep them off the dirt and reduce a distracting view drove today’s project. . I had the idea that I could use one on several steel racks that we have in the yard. We came into a few racks that are made with two inch square tubing. This particular rack had never had a bench top made for it like our other racks. 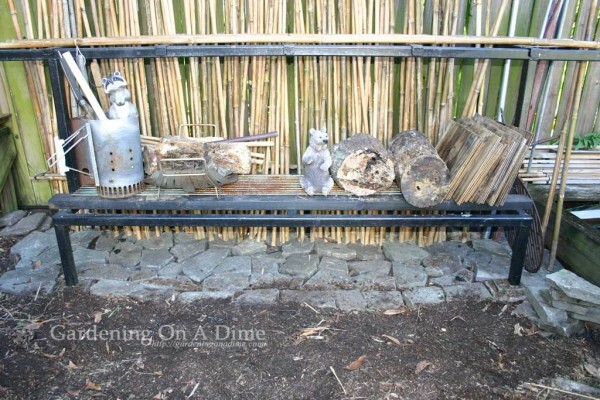 Five pole were cuts the length of the rack and spaced on the top about three inches apart. Only three were mounted on the bottom of the the rack because the bottom already has two by fours set up on the front to hold a bit of firewood. Where the bottom poles overhung the end of the frame I put cable ties to keep the upright poles from slipping sideways out of the stand. The back divider was filled today. 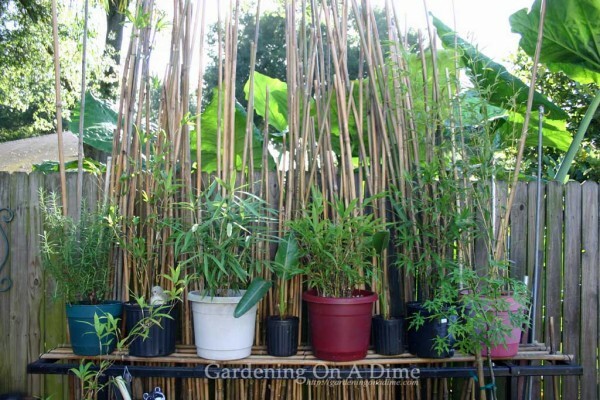 We have a Graceful Bamboo (Bambusa textilis gracilis) to trim next, so I’ll be getting another fifty plus poles next weekend. The plan is to stand the poles in the back two dividers, which should provide a nice screen while the poles dry and give us adequate storage. 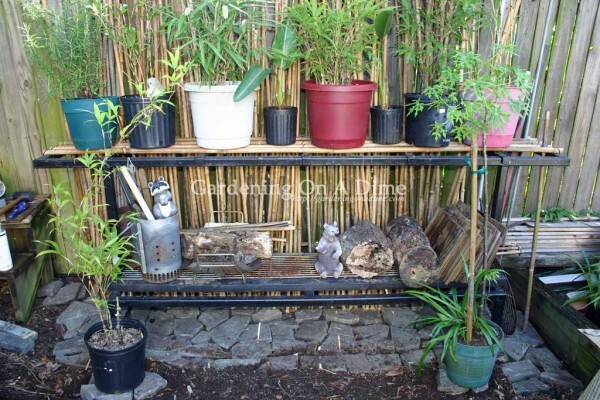 The front three poles on the top become a shelf to hold potted plants. All in all, this project turned out pretty good. 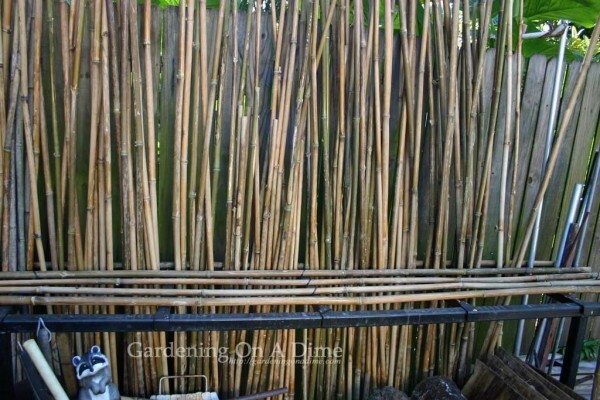 We now have storage space for our supply of bamboo poles, screened out an unwanted view and reused a pile of broken paving stones. 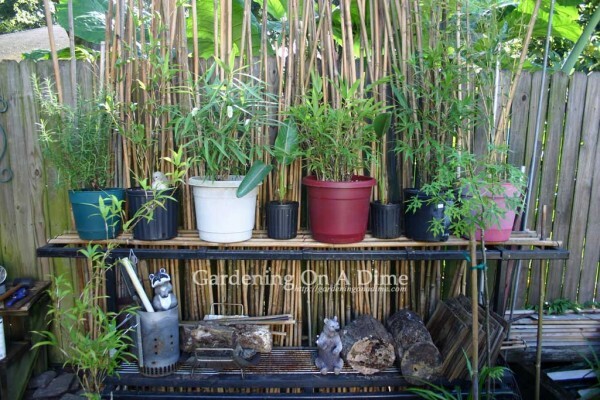 Change out a few of the plants with nicer looking pots and gather up some more firewood to stack on the bottom, (my neighbor offered me some orange wood today…great for cooking burgers) and this project is good to go…..Gardening On A Dime style. 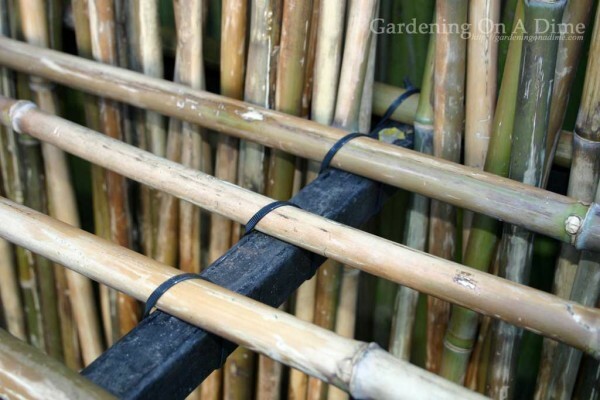 Now all we need to do is find more uses for lots of bamboo poles. Any of you readers have any ideas?